Vivint Smart Home Arena was just named Utah Construction & Design Magazine’s 2017 Project of the Year. Lead design firm, SCI and Okland Construction delivered the impressive 125 million dollar (80 million in construction costs) renovation in just 129 days—a project that should have taken 18-24 months. This 743,000 square foot, six-level renovation was “a once-in-a-lifetime type project,” said Bret McDonald, Sr. Project manager at Okland Construction. 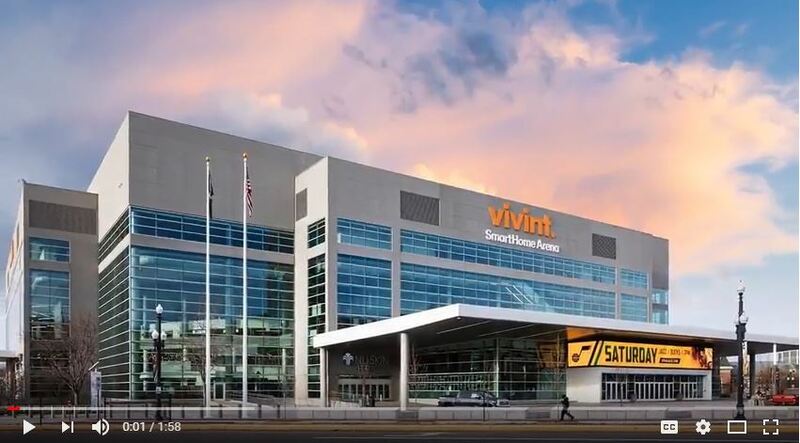 The Vivint Smart Home Arena is home to the Utah Jazz, as well as Salt Lake City’s premier music, and entertainment venue. 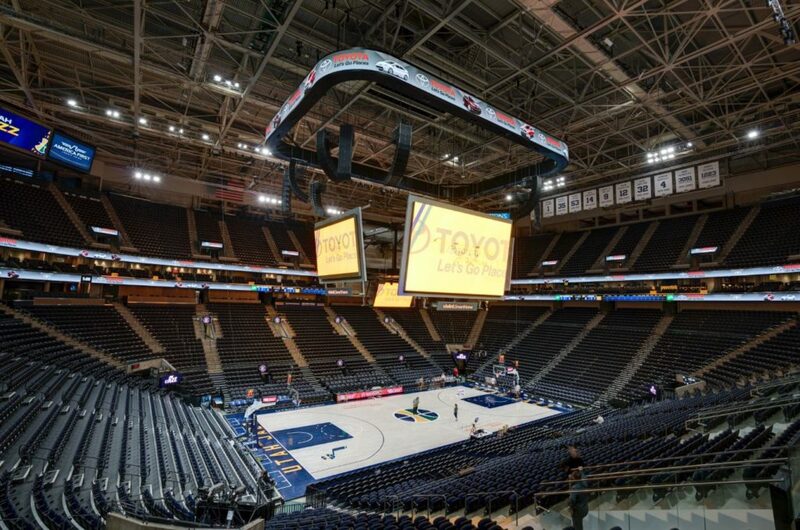 The arena is the sixth oldest NBA facility, and will become the fourth as soon as the Milwaukee Bucks finish their new 500 million dollar arena later this year, as well as San Francisco’s Golden State Warriors finishes their new one billion dollar arena in 2019. The renovation of Vivint Arena was essential to compete with the modern NBA facilities and their seemingly limitless budgets. Larry H. Miller, owner of the Utah Jazz, knew that this renovation needed to not only fix issues with the 25 year old sports arena, but that it needed to become part of the fan experience. Okland Construction and SCI Architects started the project in November of 2016 with four months of planning and procurement of long lead-time items like escalators and a retractable seating system. The front entry of the arena was shut down in March to start renovation, while the rest of the building didn’t get underway until the Jazz were eliminated from the payoffs in May. The team of 3,000 workers, and 80 subcontractors, addressed a number of concerns including overcrowded entrances into the seating areas, overloaded stairwells, elevators and concessions areas. The building, originally built in 1991, had major issues with it’s vertical circulation of people, and was corrected by moving the club seats to level two, and adding additional vomitoriums (entrance and exit passages into stadium seating area) to ease the traffic flow of people to their seats. Ticket booths were moved from level one, which now functions as a beautiful back-of-house for referees, special guest performers, and their crew, giving a more productive flow of patrons to the other five floors. The renovations also included 20,000 new, fully upholstered cushion seats, and upgraded deluxe suites, as well as four new concession areas in each corner of the arena and updating the fire alarm system. But one of the largest tasks the crew took on during their expedited schedule was replacing all lighting with new energy efficient LED, including PMC Lighting’s Nelio fixture with Aura Tuneology. The 12 million dollar electrical contract went to Hunt Electric, who had roughly 100 electricians working nearly all day with six crews working seven days a week. The PMC Nelio fixture was chosen for it’s high efficiency and it’s ability to shine the whole color spectrum onto the ceiling. The position of the lighting made it possible for the color effects to be visible from the building’s exterior. Building operators have the ability to change the up-light color of the fixtures at any time with a remote touch screen. This technology not only equips the building with options for different color schemes, but provides a level of fun and excitement that had never been attainable in the building before.